The loudest band in the realm is here! Get the MTG Craic Edition deck to strengthen your collection with valuable musician cards and epic warriors today! Collect the piping hot Irishman from the new Craic Edition expansion deck! Multiple weapon uses with extremely high lung capacity and elbow strength, and strong lyric knowledge. His spell contains a crowd-rouser multiplier. A must-have for any Craic fan and a highly valuable asset to your deck. "May the road rise up to meet you and the wind be at your back!" Get the powerful and gorgeous viking warrior of Norway! Thunderous drum weapons matched with soaring vocals, strong lyric knowledge and harmony power. When the light-bearer gift is activated, positivity will instantly strengthen your team. An essential element to any collector's deck. "May the sun shine warm upon your face and may you never lack." Pick up the heavy-medieval drummer out of East London! With massive strength and power in all types of percussion, strong harmonies, and a liver of steel, the Dylan card not only gives your team massive rockstar power, but will multiply your team's "party-factor" by 11. A necessity for the collector that loves awesomeness and hates lameness. "I drink and I beat things." Complete your Craic Edition deck with the beautifully badass German fiddler and time traveler! 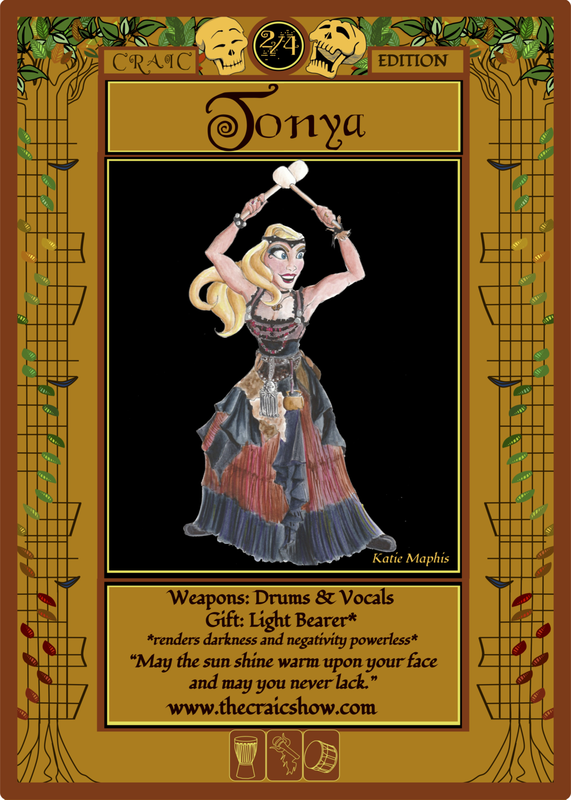 Triple weapon power (now with SUPER RARE weapon option of Nyckelharpa), powerful lead lines and solos, strong harmonies, and a commanding presence that will send your opponent's team running! If you don't have the Franka card, you are doing something wrong with your life. "May all your days be ever full of good Irish CRAIC!" Please Note - All cards have universal backs. "The Craic Show" laughing skulls will only be present on the front of the Craic Edition cards.